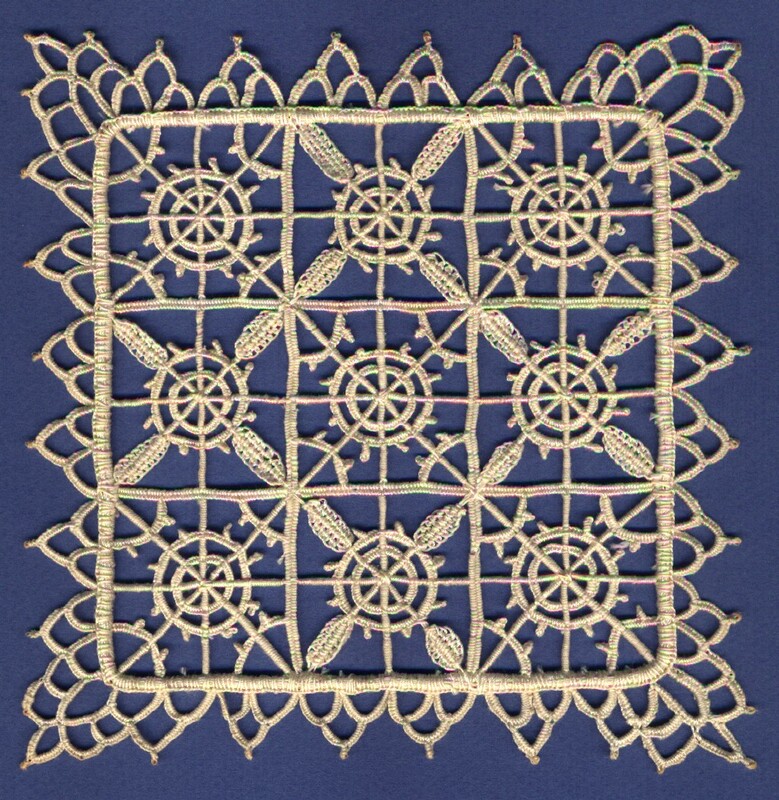 Needle lace can be fragile and delicate, simple and geometric or sculpted and solid like bendable ivory. It can also be modern and colorful. But in every kind the whole thing is made of thousands of tiny buttonhole stitches. 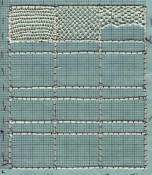 There are dozens of different variants of the buttonhole stitch, and each creates a different density or texture. If you will look at the photos below you will see this. Click on each to see the full size image. Needlelace Introduction (this page) -- general brief description of working method and history, description of and links to all needlelace pages in this website, the 4 basic methods. 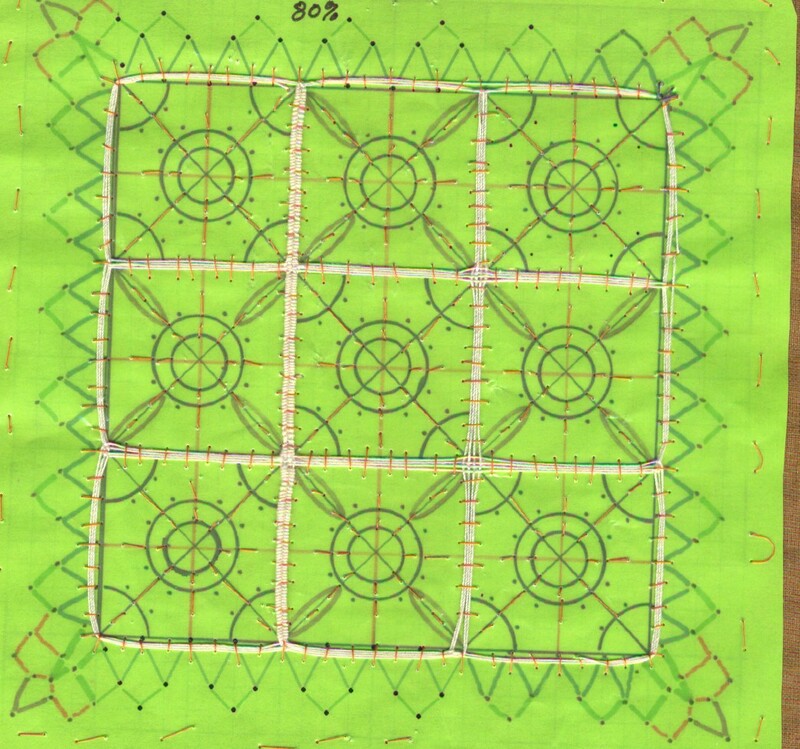 Learning Needlelace -- book recommendations, links to online lessons and other resources, start to learn needlelace, how to set up for working, the overall strategy, constructing the sandwich and the couched cordonnet method, beginning and ending a row. Needle Lace Tutorial 2 -- a simple leaf pattern with 8 spaces for stitches. Full and detailed instructions with photos and diagrams. A slightly more complex piece. Reticella Needle Lace -- a tutorial showing the working sequence, laying the cordonnet using the fil de trace and aemilia ars method. 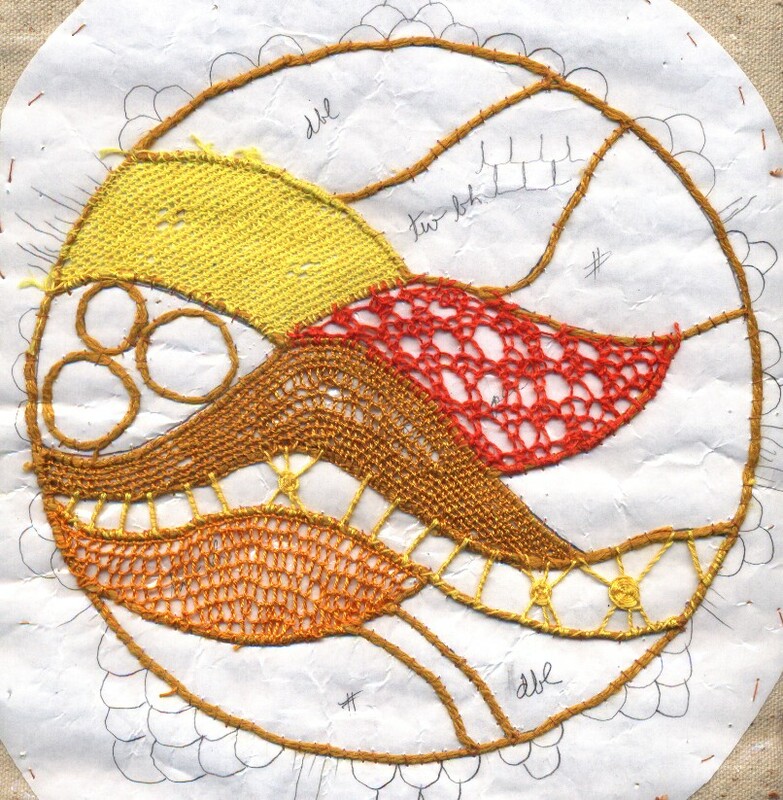 Needle Lace Stitches -- stitch diagrams and close-ups. 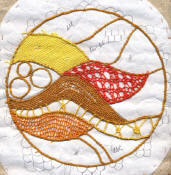 Free Needlelace Patterns -- some simple sampler patterns for trying out stitches. Includes diagrams for laying the outline threads. 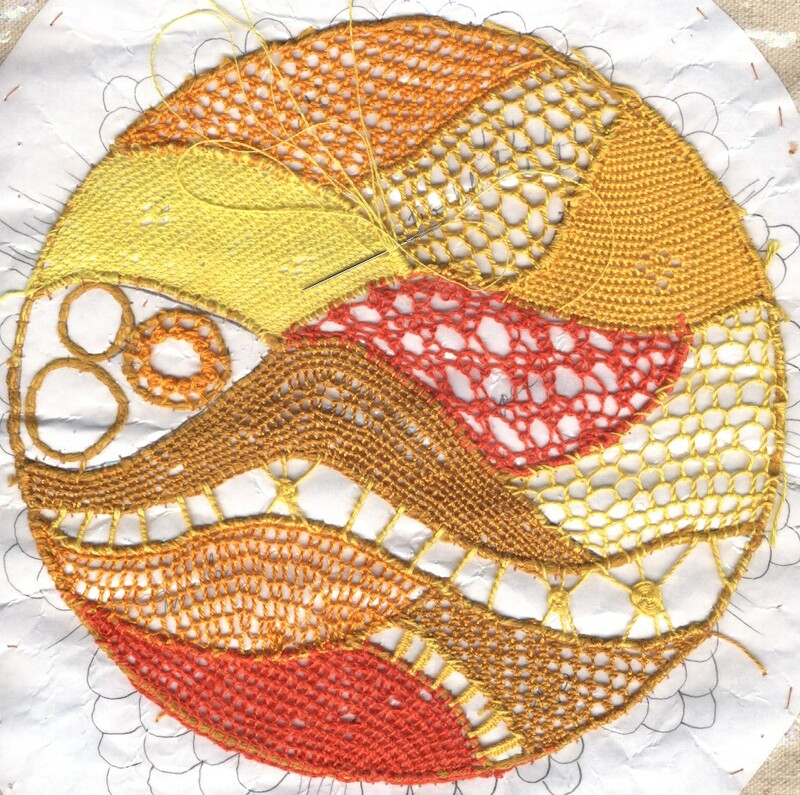 Needlelace by Living Lacemakers -- gallery of modern work. 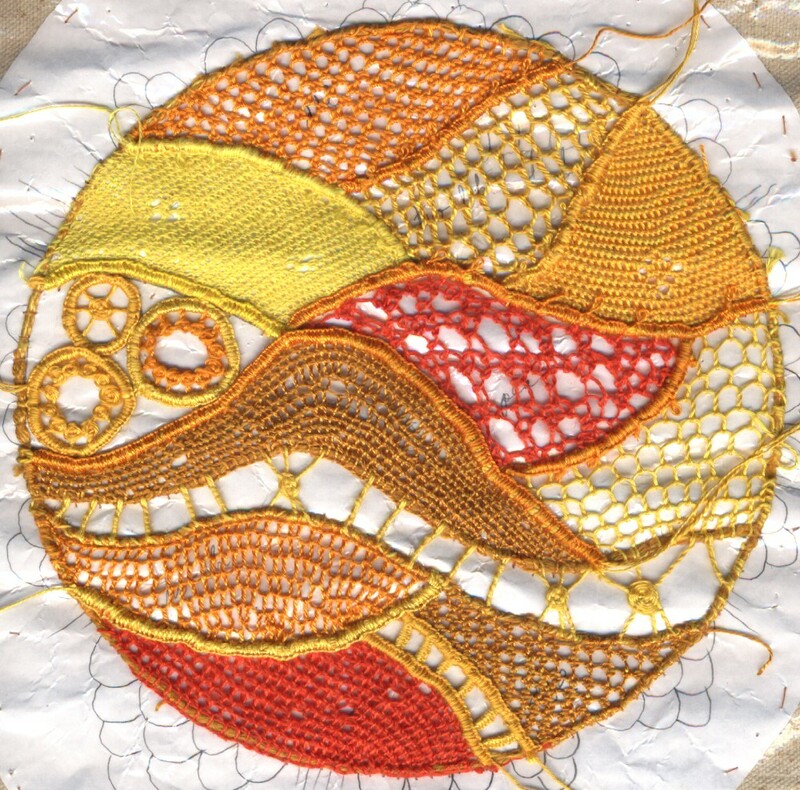 Modern needle lace images. My Needlelace -- some pieces that I have made. Stitches of Gros Point -- The stitches used in gros point and how they were used. Geometric needle laces and here and this. 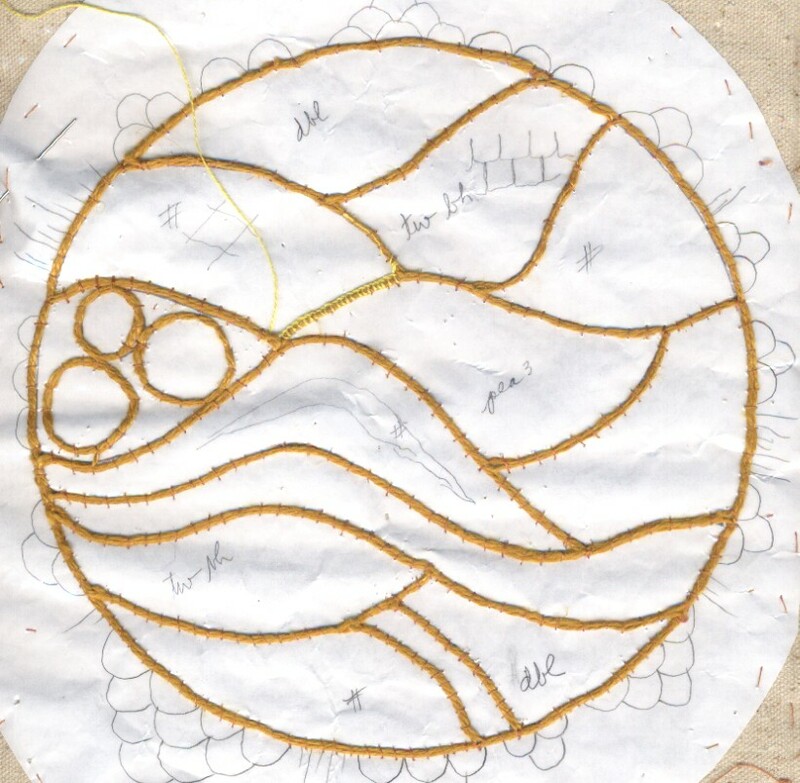 Needle lace developed out of drawn thread embroidery and reticella (reticello). In the early stages of this development some threads would be cut out of the fabric, the raw edges of the cut areas stabilized, and then fancy lace filling stitches would be added to the empty spaces. As time went on the areas where threads were removed became larger than the areas where threads remained. At this stage the work needed a temporary scaffolding while it was being worked on. So the embroiders began working with a 3 layer sandwich: one layer of sturdy cloth, a parchment pattern, with the the actual cloth being embroidered basted on top. The layer of coarse fabric and parchment were only a holding device to keep everything stable. The lace stitches would not pierce the parchment, but would be anchored to the cloth being embroidered. At this stage somebody finally realized that no cloth was actually needed at all. 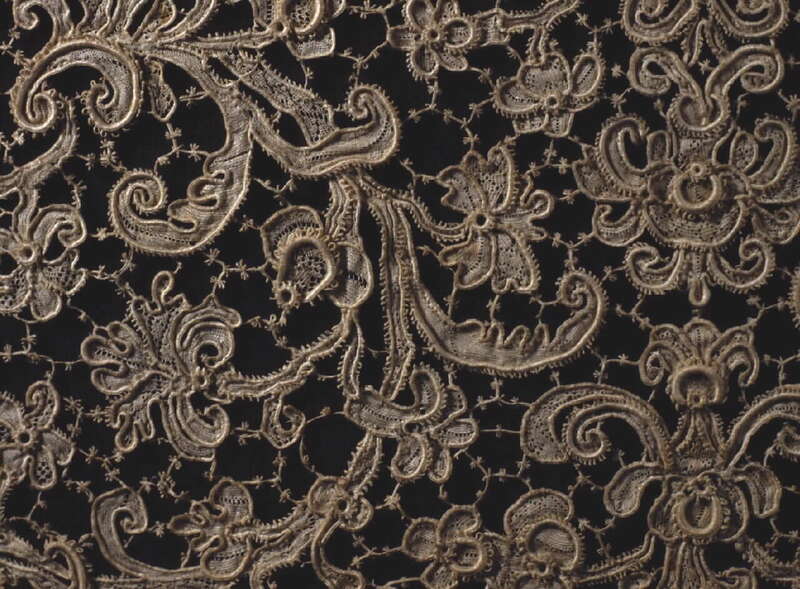 Santina Levey, in LACE, says that the transition occurred during the time period 1565-1585. Click to see large drawing. This point is when true needle lace begins. It is very ingenious, really. You are making "stitches in the air" but you need a temporary scaffolding. So the lace maker builds a sandwich of layers of cloth and pattern which does not become a permanent part of the lace. 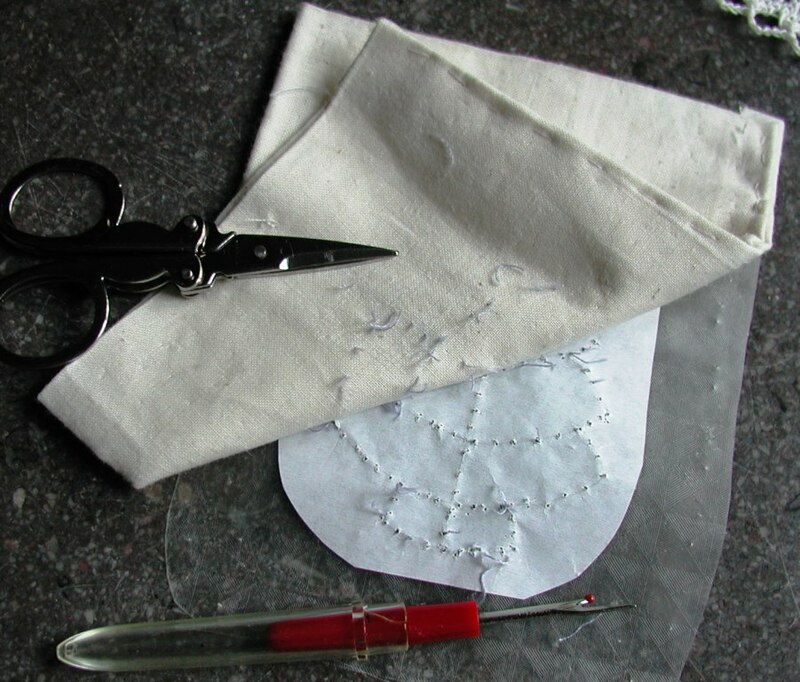 You have two or more layers: a layer of coarse fabric, with a heavy paper or parchment pattern on top. The design lines are marked on the pattern. A thick cord doubled is laid down and couched in place along all the design lines and hooked to itself at every change of direction. This thick cord is called "the cordonnet" (or "trace threads", or "outline threads"). It never pierces the pattern, but remains lying on top of it, couched in place by temporary couching stitches which will be removed later. This doubled cord is the skeleton that holds the lace together. The "stitches in the air" are connected to this cord. Neither the cord nor the lace stitches ever pierce the pattern or sandwich. 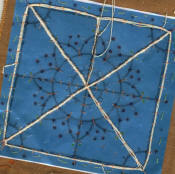 This is the basic working method for westernl European needle lace. 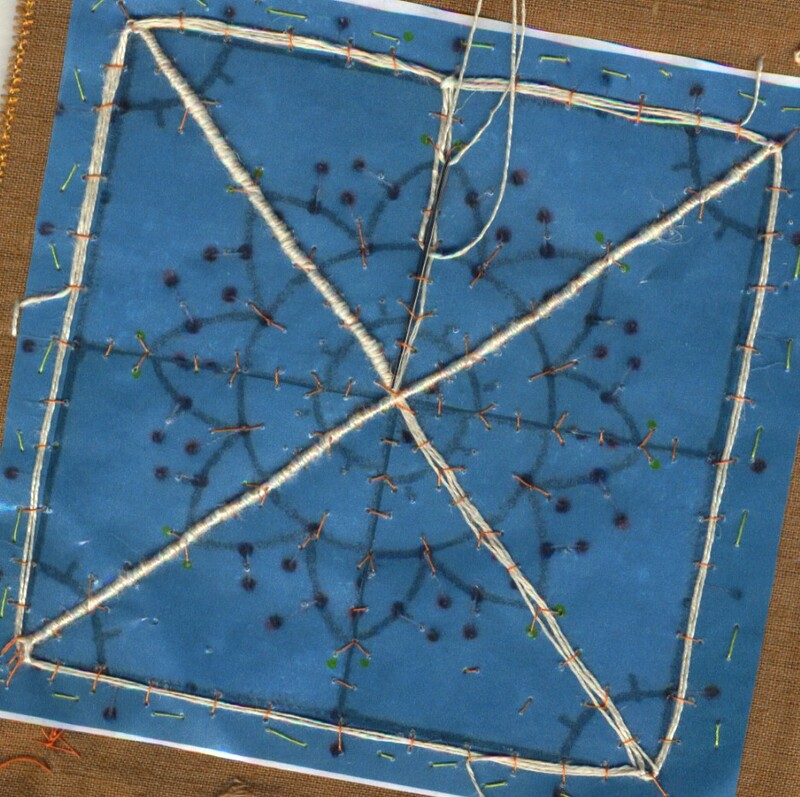 aemilia ars method -- start by putting tacking stitches onto the pattern (as for the fil de trace method), then run the cordonnet/outline threads along a pathway that allows you to fill in the lace stitches as you go. Start with the outside edge, then lay the major diagonal and horizontal and vertical lines in 2 passes. After the third pass begin covering the the trace threads with the final buttonholing or other stitching. working entirely in the hand with knotted buttonhole stitches -- puncetto or bebilla/oya/Armenian/Mediterranean/Turkish needle lace methods. No sandwich or scaffold is necessary. 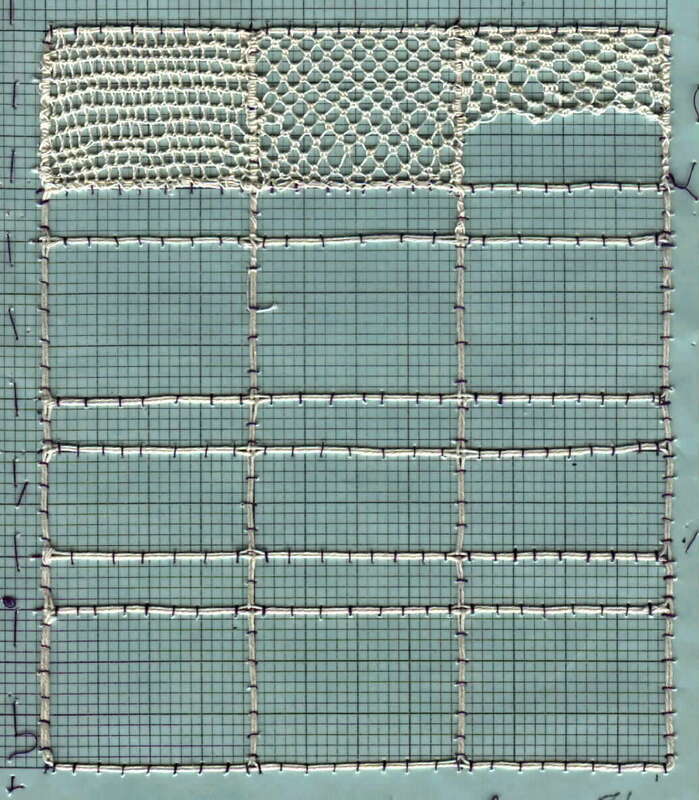 Below shows the needle lace method of couching down the foundation threads first, and then filling all the spaces. In the left photo below the dark purple stitches are the temporary couching stitches. If you look closely at the intersections of the cordonnet you can see how the cordonnet was linked to itself in those areas. 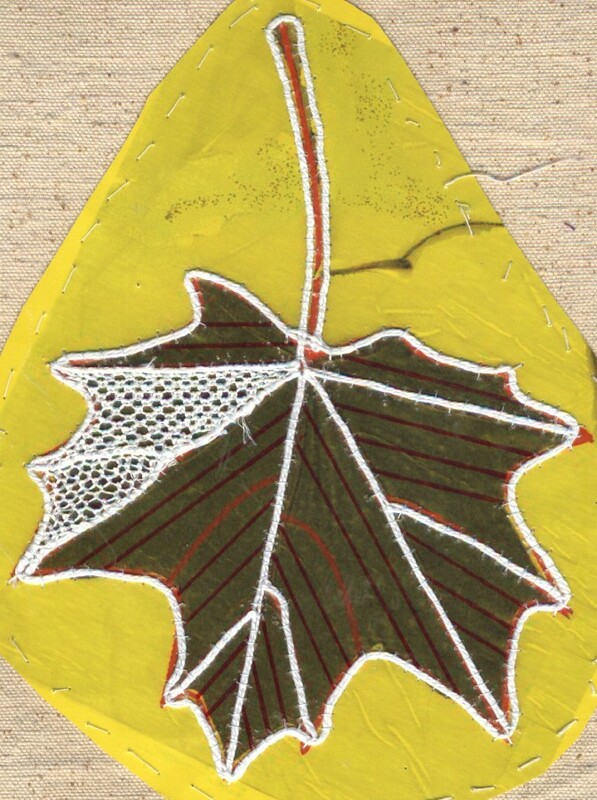 On the leaf pattern you can see the tiny couching stitches that straddle the white outline threads. 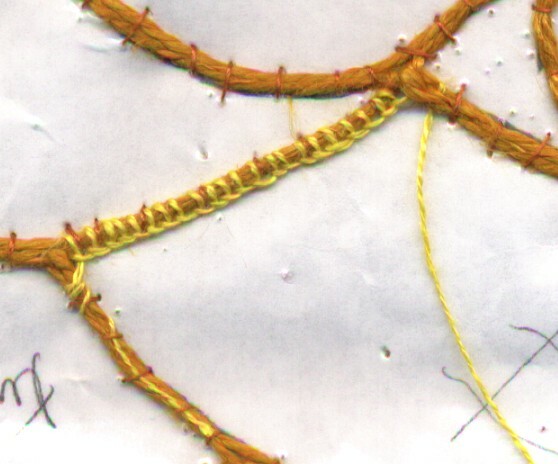 When all the work is completed, both cordonnet and lace filling stitches, another layer of very close buttonhole stitches is worked over the cordonnet. 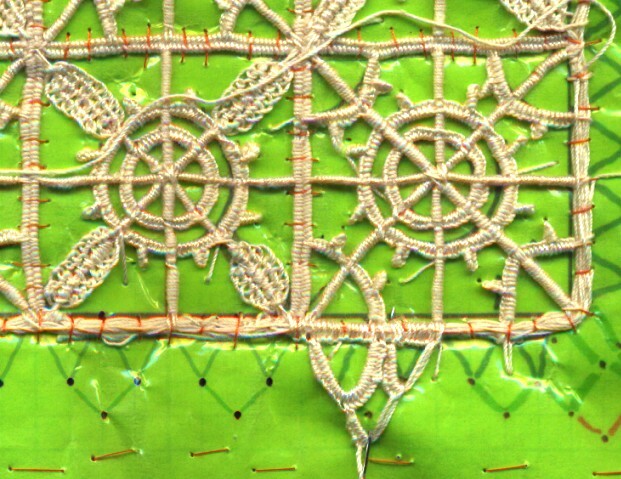 The thread for the lace filling stitches is wrapped around the cordonnet to begin, and wrapped around it again to end. The final step of close buttonholing over the cordonnet permanently secures these beginning and ending wraps so they don't come loose. 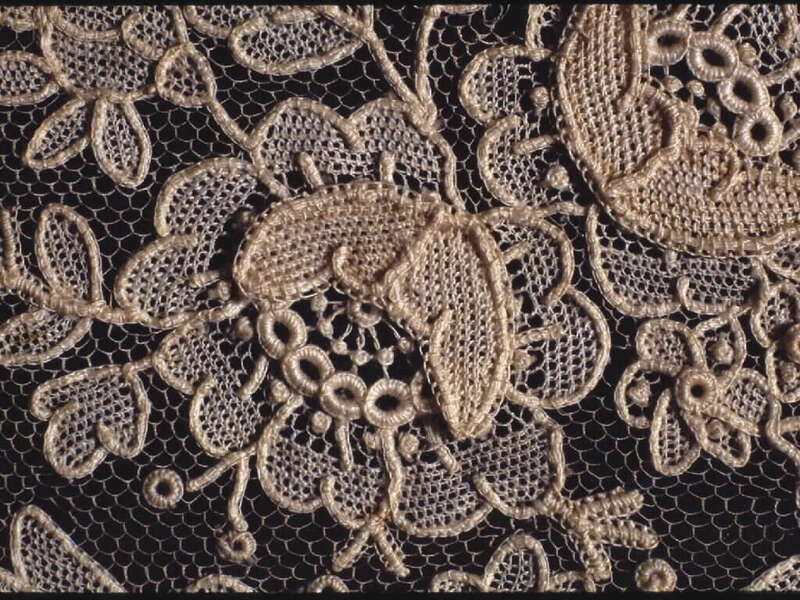 All the stitches used in the actual lace are buttonhole stitches, many many variants of buttonhole stitches. Different spacings, whether or not twists are added, exactly where you put the needle all produce markedly different textures and densities. Working needlelace is about juxtaposing density and textural differences in a beautiful and balanced way. 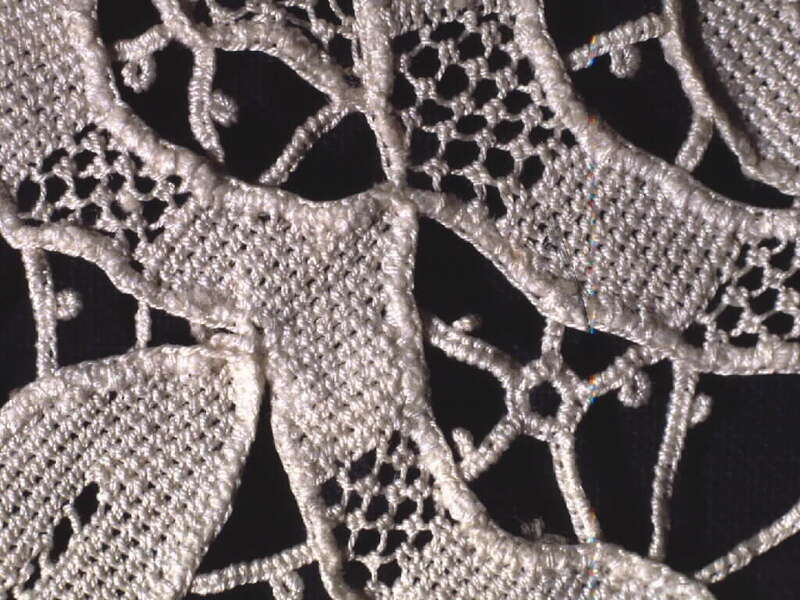 Historic forms of needle lace have names such as Venetian gros point, Point de France, Point de Sedan, Argentan, Argentella, Alencon, Point de Gaze, Youghal. Each of these typically uses a certain selection of the possible buttonhole stitches, and designs of a certain character. Some were thick and solid, some were very fine and fragile. In the photo below you can see the purple couching stitches. 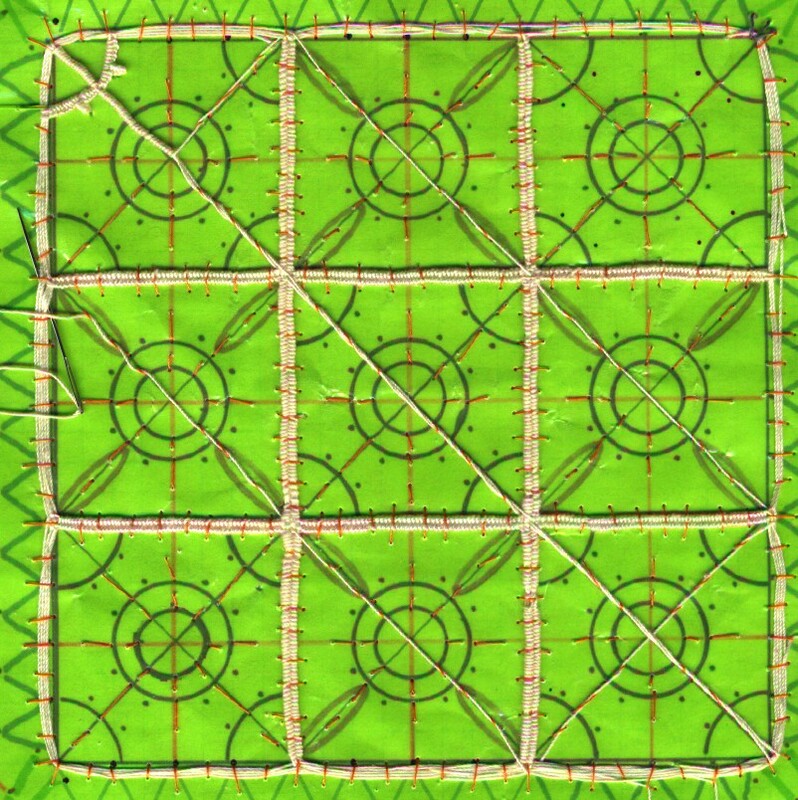 Only the couching stitches pierce the pattern and fabric backing. The reason that you have 2 layers of coarse fabric is that when the lace is completed, you slide a scissors or knife between the 2 layers of the cloth and cut the couching stitches. The lace then comes free of the sandwich. Cutting between 2 layers of scaffolding cloth removes the danger that a slip of the scissors could ruin the work. This working method is explained in more detail in learning, tutorial 1, and tutorial 2. 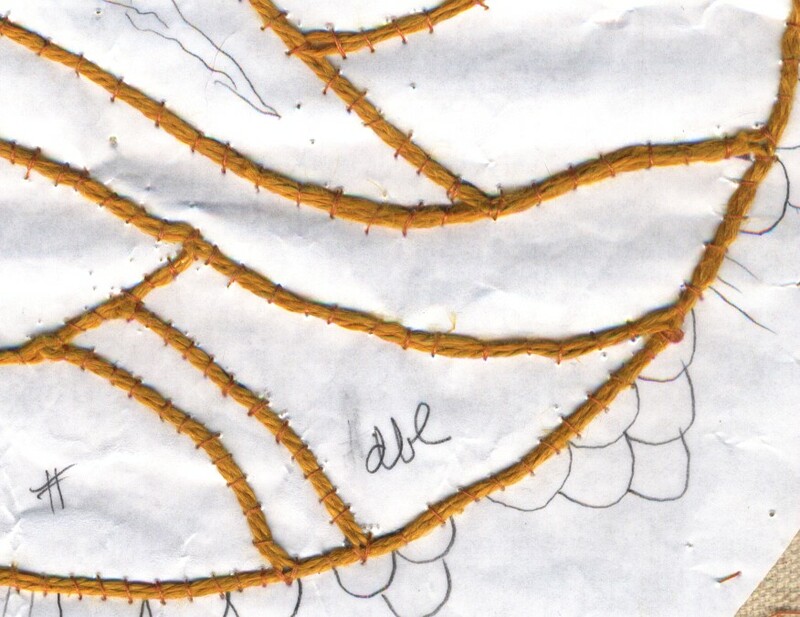 There are some other ways to approach the problem of creating a scaffolding to support the lace stitches. In the "fil de trace" method little couching stitches are made onto the pattern, and then the cordonnet is threaded under the little stitches. 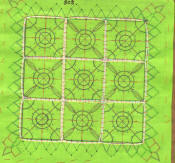 It is an alternative method for solving the problem of creating a skeleton. Couched cordonnet method Left: couching the pair of outline/cordonnet threads. This is the needle lace or couched cordonnet method. Right: putting in tacking stitches first and then running the outline thread under the tacking stitches. This is the "fil de trace" method. 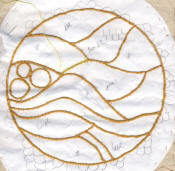 The aemilia ars method is similar to "fil de trace" but uses fewer tacking stitches and builds up the shapes working on both sides of the trace thread. Here you can see that all the little orange tacking stitches were put in first. I have run the outline thread around the outside of the piece, and have run in some of the major horizontal and vertical lines. For the fil de trace method, all the vertical, horizontal and diagonal lines would be run in before any of the lines are overcast or buttonholed. On the central vertical line I have run the thread under the tacking stitches once, and am halfway back to the center. You can see the needle is run in under the tacking stitch. I put in orange tacking stitches first. Then ran outline threads under the tacking stitches for the outside border and the major internal horizontal and vertical lines. Since I will work needle weaving over those lines, I am laying 4 foundation threads on the major vertical and horizontal lines. Lay the major diagonal line, and start working the farthest corner square. 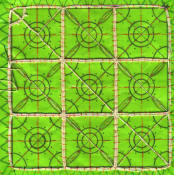 Lay in the subsidiary diagonal, horizontal and vertical lines only when necessary to complete each square of the design. Each loop on the edge is worked over 3 foundation threads. For the full working sequence look at this. 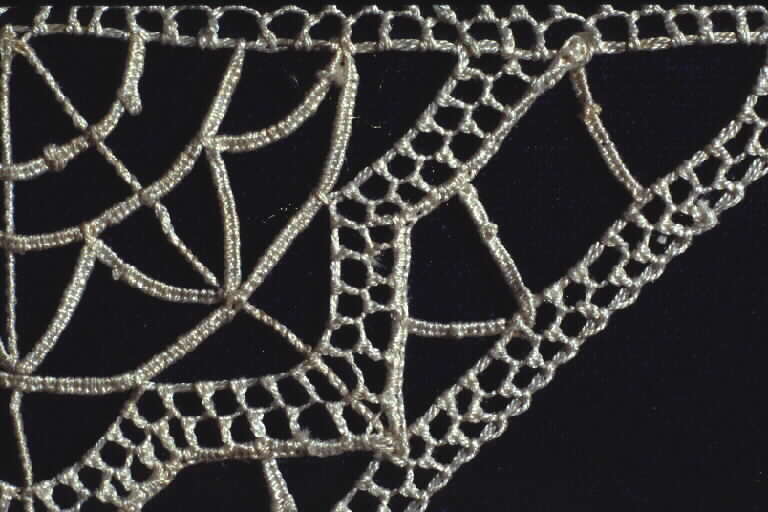 Some styles of needlelace, such as Aemilia Ars,, attached the lace thread to a central skeleton thread and the lace stitches were worked on both sides of the thick cord to build up a shape. 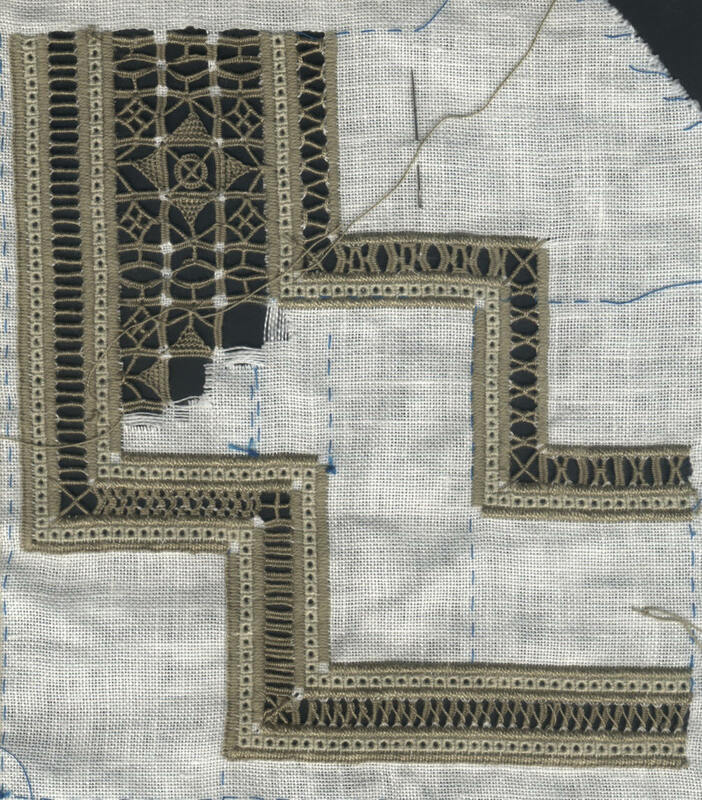 The little couching stitches are made onto the pattern first, and then the cordonnet is threaded through the little stitches, as for the fil de trace method. Then shapes are built up by being worked onto the cordonnet as the cordonnet is being laid. 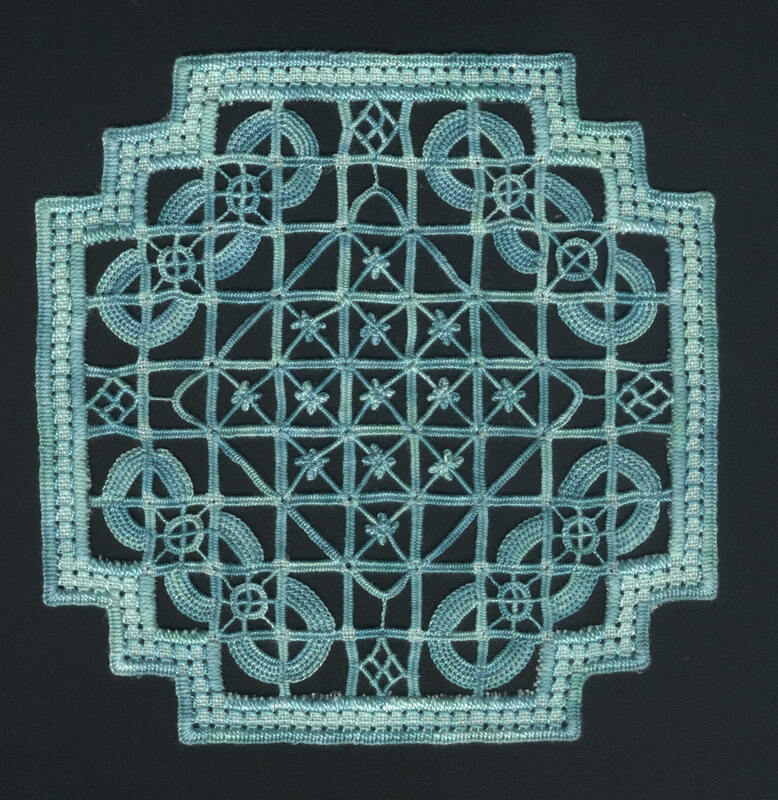 The piece below is needle lace in the reticella style, but I'm using the aemilia ars method of working. Look closely at the 1st photo and you will see little orange stitches all over, and only some of them have threads running under them. As I work I run the foundation threads under those little stitches, building up the foundation scaffold line by line as I work, instead of couching them all down at the beginning. It is just another way of laying the foundation threads, but it does require a different kind of thinking. Some forms, such as puncetto (Italian) and oya (igne oyalari or igne oyasi, bibilla, bebilla, Kene (Turkish, Armenian, Mediterranean, Bulgarian Kene) can be made entirely in the hand exclusively of knotted buttonhole stitches, without any kind of temporary backing. In these forms tension control and stitch placement are entirely in the hands and skill of the lacemaker. But these were sometimes worked attached to a cloth and made into an edging for that cloth. NEEDLELACETALK has interest groups which are trying to clarify these distinctions. See http://needlelacetalk.ning.com/ for information and advice. 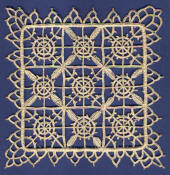 For more information on learning needle lace -- books, good online lessons and explanations -- go to Learning Needlelace.